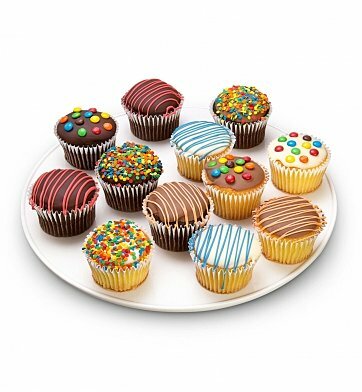 Amaze the cupcake lover with twelve cupcakes in assorted cake flavors, each hand-dipped with chocolate topping and lavishly decorated with a variety of toppings like sprinkles, icing and more. It's a gift that the recipient will never forget! 12 Specialty Cupcakes in Chocolate and Vanilla Cake. Each cupcake is hand-dipped and drizzled in Belgian chocolate. Hand decorated with candies, icing, and confections. if ordered by 3:00 am EDT Wednesday April 24th. Chocolate Covered Birthday Cupcakes is a hand delivered gift. These gifts are delivered by one of our local design centers located throughout the United States and Canada. Same day delivery is available for most gifts when ordered before the cutoff time. The cutoff time for Chocolate Covered Birthday Cupcakes is in the recipient's time zone. One dozen fresh-baked cupcakes in chocolate and vanilla cake. Dipped in dark, white or milk Belgian chocolate and hand-decorated. Delivered fresh to the recipient's home or office in a beautiful gift box.